So now that gestation is winding down, baptism plans have entered the scene. Like any decent Catholic event, that means there’s going to be food and mingling afterwards to celebrate. Now I don’t pretend for a minute that the baby is really who we’re focused on, mostly because the little tyke will only be about 2 weeks old and therefore will undoubtedly be more interested in nursing, cuddling, and napping than WOOHOO PEOPLE AND FOOD! I mean… technically yes… since that’s who received the sacrament and the reason we’re all there… but really. At our wedding reception, we were just short of ignored because people were eating and catching up, and that’s just the way it is. (Well, I was also largely unsuccessful in dragging people out onto the dance floor with me so maybe my isolation is more justified.) What I mean is, no one expects the newly baptized baby to stay awake or congenial or give a speech. So really the planning itself is geared towards the attendees and the theme. I actually miss planning things like this. It’ll be a year on Monday since we got married, and goodness knows I did planning and prep right up to the zero hour. I am, of course, not hosting the baby shower so that planning and prep is out of my hands. So, baptism party plans, yeah! The first question is of course where to have it. That mostly depends on how many people we have and whether my parents would be ok with having it at their house. The question exists only because our apartment is on the small side. By “small” I mean the biggest table we can have is two card tables put together, and that takes up just about all of the living room. So seating and milling around space is very limited. Note: the public areas of this place are the living room, the two-person kitchen, and the bathroom. There’s nowhere else to go unless you count our tiny not-covered porch, but it’ll be hot as blazes in the August afternoon. By card tables I do not mean to give an example for size purposes; I mean that we would be using one or two very rickety card tables. We also do not have real chairs; just a couch, rolling office chairs, and metal folding chairs. Did I mention this would all be on our carpeted living room floor? My parents live about the same distance away from the church as we do, although in the opposite direction – which doesn’t really matter much. They have an actual decent house, so of course there would be no space or seating issues at all. Then there is the food. Truly the best part of a party. No matter what party I am at, if I don’t like the people or the music or the decorations or the location or the occasion or whatever, if there is plenty of great food then to me that was not a terrible party. I will be happy to make conversation with the punch bowl, sing karaoke with the hors d’oeuvres, and slow dance with dessert. I love planning, making, and eating food. In fact usually I have too many ideas. I’m going to throw a bunch of them on here and see what sticks. I like themes because they help me both come up with ideas and narrow the options. There really aren’t any traditional baptism foods and I’m not going to serve roasted dove, scallops in the shell, and water, so that isn’t a good theme. Enter other themes. Salad theme. This appeals to me because basically everything can be made well ahead of time and it just tastes better for having sat. This includes sandwiches of egg salad, tuna salad, and chicken salad, as well as sides of potato salad, fruit salad, caprese salad, and green salad. This doesn’t have to be a frightening mayo overload either, what with tasty partial-or-complete substitutions of sour cream, Greek yogurt, and buttermilk. There isn’t anything hot, but like I said this will be in August and around noonish (baptisms are scheduled for 10am and it’s about a half hour drive from the church either way), so it’ll be plenty hot outdoors. If someone wants something hot they can stand outside, although I advise standing in a bucket so it’s easier for somebody else to haul the person back indoors once they have melted or turned to ash. Chips and dip are of course a must. This also avoids having to use the oven or the stove on the day-of. The downside is everything could turn out too similar to each other and be boring. But it would be a great way to realize my very long-held dream of making these cuties! I think food should be visually appealing, and if appropriate, fun to eat as well. Bite Size theme. Unfortunately this one has the very real possibility of being very starch-heavy since I am a great big fan of carbohydrates. This would include things like bacon parmesan shortbread, my mom’s Waikiki meatballs, olive cheese bites (basically a tiny cheese biscuitty-puff thing with a pitted olive stuffed with pimiento or garlic inside – I came across the recipe a couple days ago and I think my husband might just be a fan), the ubiquitous sausage and cheese biscuits, fresh fruit platter, veggies and dip, sun dried tomato basil and feta scones, and deviled eggs. This selection wouldn’t be difficult either because they all can be made ahead too and the only things served hot – meatballs and sausage-cheese biscuits – can either be in the crock pot or heated up upon arrival without detriment. 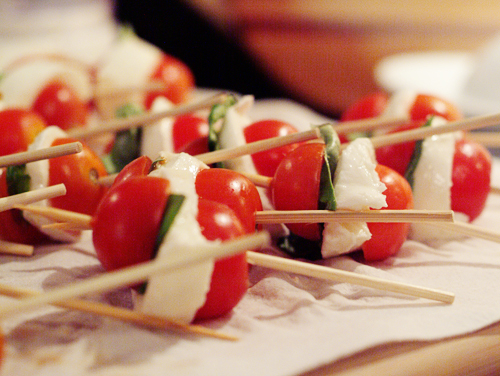 Here’s a picture of the olive cheese bites, because I like pictures almost as much as I like parties. Then there are beverages. I don’t plan much about the normal beverages like water, iced tea, and such, but a good sacraments party ought to have a good punch. It seems to me that punches are falling out of fashion if not downright unfashionable by now, and that’s sad, because while bad punch is very bad, a good punch is very good indeed. Besides, I would hate to see all the beautiful punch bowls and ladles lie unused or disappear. (I don’t care about plain plastic ones. They can languish on Goodwill shelves forever as far as I’m concerned.) I am also a big fan of decorative ice rings or floating bergs of sherbet or ice cream. Also it means I could have a cool watermelon punch bowl like this. Even if it were little, I could just refill it with punch from a pitcher in the fridge every now and then. Then there is the color matchy thing. White and blue are pretty much the baptism colors due to purity, doves, shells, and water. Blue punch would be weird, unless it were milk dyed blue for a Star Wars party but that is neither here nor there. However, I did come across a lovely white punch recipe. It doesn’t seem like it would have a lot of flavor though – the only flavor-imparting ingredients are almond extract, lemon-lime soda, and vanilla ice cream. On the other hand, I am usually a fan of anything that sounds like dessert. An equally beautiful and more flavorful golden punch might be the better move. There’s already going to be so much yellow surrounding this child it’d better wind up his favorite color. CAKE. Even if we have the tiniest most slap-dash cheapest party ever, there will be cake. Cake and tap water, perhaps, but cake none the less. I have an excellent and relatively foolproof recipe for vanilla cake, so that of course is the main contender for type of cake, and it probably won’t change. I like out-of-pan cakes much better than in-pan cakes, and decorated cakes the best of all, although sometimes I have to be talked down from the wilder flights of creative fancy. I have three ideas floating around in my head right now and none of them seem very difficult. Please don’t make fun of the picture. It has very delicate feelings. The first one is inspired by a baptismal font, in case the illustration is a little difficult to interpret. There’s a tradition for baptismal fonts to be octagonal, and have a gold domed cover with some symbol on top like a cross or a dove which doubles as a handle. It might seem like this cake would be very large but really it would only be tall. The dome part would be baked in a Pyrex bowl like it says, and I would probably just make a rectangular cake and cut off the corners and eat them all by myself. 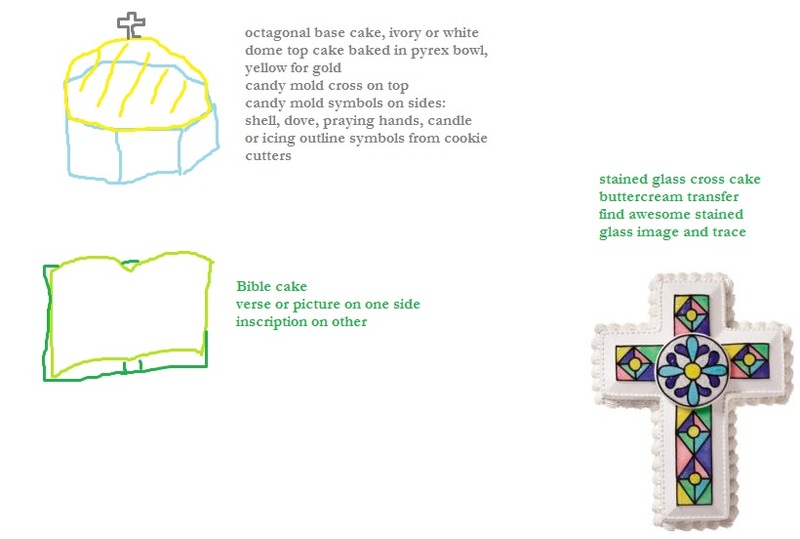 The Bible cake would of course have to be baked in a book pan which I would have to get, because putting together two normal 13x9s is not only a very large amount of cake but also looks funny. I would probably use the verse from Samuel, and hopefully think of something less derpy than “Happy Baptism, [Name]!” Suggestions in the combox are absolutely welcome. As for the last one, it would probably be the easiest of all. Since I don’t have a cross pan either, I’d use the instructions from The Creative Collage to make one from a rectangular cake and once again eat all the cake scraps myself. I would just make the top one big buttercream transfer picture and only have to frost the sides. Buttercream transfer is a very easy technique that really ought to be classified as cheating because if you are just barely skilled enough to trace an image right in front of you, you will wind up with a result that looks way beyond what you should be capable of doing. The method: You print out a picture of whatever you want – clipart or other line drawings are the easiest to do. You tape it down on a cookie sheet or something flat. You tape a piece of waxed paper on top of the picture. You pipe frosting in the appropriate color along the outlines of the picture and its various details. Freeze it to prevent possible color bleeding. Then you fill in the picture with other appropriate colors, making sure you don’t leave any gaps or air bubbles on the bottom, and freeze that. Then you smear the whole thing with a layer of whatever color frosting you’re going to have on the rest of the cake. Freeze a third time. Get your cake, frosted or unfrosted – I tend towards unfrosted because there’s already a rather thick layer of frosting going on in the transfer itself, unless you’re very careful to keep it thin. Lift the waxed paper off the cookie sheet. Frozen frosting is pretty hard so you don’t have to worry about it warping or sliding, but it is possible to snap it. Turn it over and set it down wherever you want the picture of be on the cake. Slowly peel off the waxed paper. Voila – someone with zero ability to freehand a drawing using frosting (that’d be me) – just wound up with a trace-perfect picture. If the cake is unfrosted, it’d probably be best to use a large tip to pipe around the transfer and then smooth it out level with the rest of the background frosting, so doing a crumb coat first would be wise. As the frosting warms up, you can smooth out any gaps between the transfer and the rest of the frosting. Obviously I won’t trace all of the pieces; probably just the dove, the rays, and the shell. It’d look nice going down the bottom part of the cross, with perhaps a chi rho at the top and an inscription across the crossbeam. Hah. At almost nine o’clock at night, the husband finally becomes aware that we haven’t gone grocery shopping yet. This entry was posted on Sunday, May 27th, 2012 at 1:30 pm	and posted in Uncategorized. You can follow any responses to this entry through the RSS 2.0 feed. I sure hope I can save enough pennies to make the baptism (and the party)!! As wonderful as the baptism will be — especially if it’s the complete rite as celebrated *outside* of Mass — the food looks mighty tasty, too. What’s that you say? Company?? Yep, that will be enlivening as well! The baptism is, as stipulated by our parish, a once-a-month group baptism outside of Mass. One of the currently unknown factors is whether they’ll have any kind of tiny reception afterwards at the church, and whether I will thereby feel too awkward or ungrateful or whatever to still have our own.